Last summer I received a Calla Lily that was purchased from a grocery store. After it bloomed and the blooms died, I cut the dead flowers off. Since then I've kept it in the pot in a window. This spring it started to sprout new stalks of leaves but all they do is to grow super tall green leaves that fall over. I live in Fort Collins, Colorado so I'm not sure if I can plant them outside. I'd love them to bloom again but not sure if they will being from a grocery store vs. a nursery. Previous owners of our home planted a grocery store hydrangea outdoors, and while the plant comes back every year, it never creates blooms, hence my hesitation to plant the calla lily outside. I would be grateful for any suggestions on what to do with the lily, and the hydrangea for that matter. Thank you. 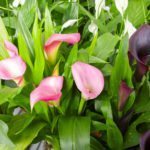 Calla Lily can be placed outdoors either in pots or in the ground. If you live in a zone 8 or warmer garden they can stay in the ground year round. If you live in a colder climate you will need to winter indoors. The drooping plant can be due to a few reasons; including watering issues or lack of nutrition. These articles will help you pinpoint the issues and refresh you on the care requirements.